A DATE and venue for the first Social Media Café get-together in Manchester has been agreed upon. The meeting will take place between 6-9pm on November 11, at the The Northern pub, 56 Tib Street, Manchester. More from Sarah Hartley: Social Media Cafe venue selected. TWO blogging pals, Kate and Chris, are offering people who want to start a blog a chance to test the water. The two of them will be hosting blogging workshops being held at Gorton Library on November 22 and Crumpsall Library a week later, click on through if you want to get bloggy. THERE has been much written in the past couple of days about the death of blogging after an article appeared on the Wired website saying blogs had been superseded by micro-blogging services such as Twitter. Yikes, it even made the Today programme. 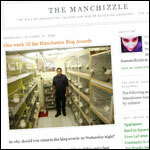 But if anyone was at the Manchester Blog Awards last night the news of the death of blogging was somewhat premature. To applause and cheers winners of this year's awards offered up an interesting and varied mix of styles and genres, from creative fiction to useful locally based services. Sarah Hartley has drawn together some interesting highlights from the night, and when you consider two bloggers from Manchester, Chris Killen and Maria Roberts, will soon have books published, I feel there is life in the old blog yet. SLOWLY TypePad are rolling out a new look editor within the service, and today it was the turn of many of the accounts I help people with. And so I've had a few distressed calls as suddenly the old way of doing things has been wiped out by what looks like a new, snappy option, but which caused a bit of worry amongst my friends. When I help people start a TypePad site I set it up so that the editor is in a Plain Text format, this means people can easily write articles elsewhere and copy and paste them across. And most of the people I work with don't need to change font types, size or colour, they just want a simple text editing tool so they can spend time writing and not fiddling around with HTML and layouts. The feeling was that the group should meet monthly, that it should be outside normal office hours and that it is open and accessible to anyone with an interest in social media whether that's as a user, supplier, creator, teacher or whatever - if social media's your passion, this cafe should have something for you! My pal Andrea Wren is heading up a course to be held at Gorton Monastery towards the end of November that will teach you the types of things you need to be doing to get editors to take you seriously. The new tools of the internet, and changing attitudes amongst readers, means such experiments can take place and very often they prove more successful than the old 'scarcity' mentality. Does exactly what it says, points you to some websites that can help you add a bit of sparkle to your own blog articles. Media consultant and journalism professor Juan Antonio Giner is a fan of the QE2 and when he was set to travel on the ship's final journey he pitched the idea to some newspapers, they didn't bite but Cunard did. AUTHOR Paulo Coelho has made available the speech he gave today at the Frankfurt Book Fair. Time will tell me how how to recover the money I myself am investing alone in my social communities. But I am investing in something for which every single writer in the world would be grateful: to have his texts read by a maximum of people. I HAVE been scribbling away on the Landscape Juice Network on why I think businesses should be using blogs to help rise above the rest in these potentially recessionary times. I AM sure that whatever business you run, at the moment there are many people full of doom and gloom about the future. But I've always been a questioning, contrary, bugger so I'd like to highlight why I think you should be using the network now instead of bunkering down in the coal shed. Blogging for Business in Black And White from KMP on Vimeo. LAST week I took part in a workshop that turned out to be a thoroughly enjoyable morning of showing people how to start their first ever blog. Interested in a Social Media Cafe for Manchester? WHILE I am the biggest fan of all this blogging, tweeting and countless other ways of linking up with others in this Web 2.0 world, sometimes you can't beat a good old chin-wag. And it is with this in mind that Sarah Hartley, of the Manchester Evening News, is keen to gauge interest in starting a Social Media Cafe for the city. There are no hard and fast rules at such get-togethers, see it more as a chance to share experiences, discuss start-up ideas or finally but a name to that tweet.